First, I apologize for being away so long. Life has dealt our family a cruel blow, but we're surviving and life will go on. Needless to say, I haven't felt a lot like knitting lately, but it has bothered me that I haven't been posting as often as I'd like to. On a happier note, my grandson, Micah, recently turned 5. 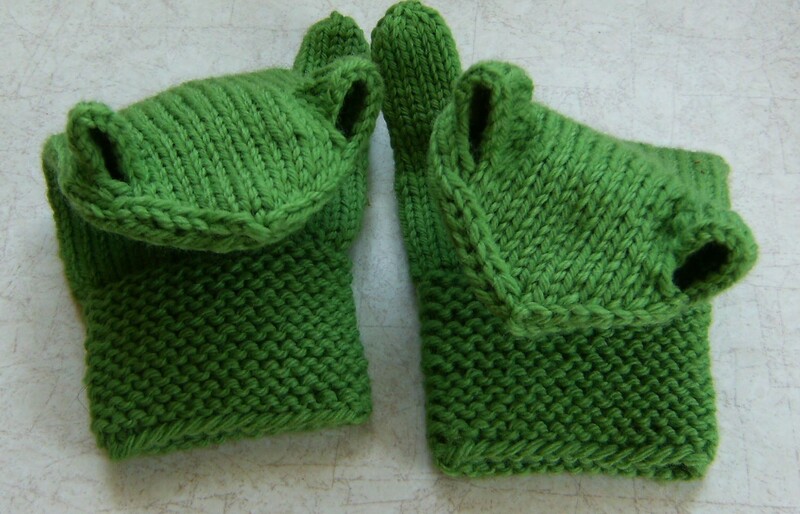 As I've told you before, he just loves frogs (shudder), so I thought it would be fun to knit him some frog mittens. This is the Frog Mitts pattern from Morehouse Farm . They had a big sale on all of their patterns, so I couldn't resist this one, plus a "few" others. They also sell kits in addition to their patterns. The only drawback on these is the two holes for the eyes. I'm not so sure how practical it is to have two holes in your mittens! Still Micah seemed to like them and he insisted on wearing them home, even though it was close to 85 degrees! 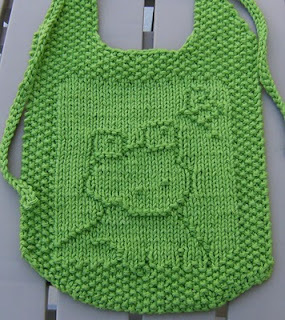 I used Cascade 220 in Palm Green. A nice froggy green! 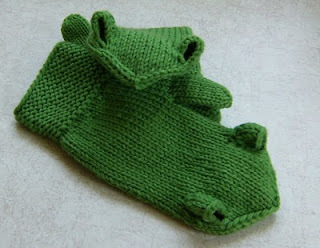 I also knit him a pair of froggy socks. Well, at least I tried to make them. I haven't ever used intarsia on socks before and after these, I doubt that I'll ever try it again! I started out using black and green, but after starting and ripping, or should I say "frogging" it three times, I ended up just ditching the black and starting over with the navy blue. I had a hard time getting a nice smooth cuff. I had much better luck with these, or so I thought. When Micah went to put them on, we could barely get them over his heel. There is hardly any stretch to the cuff, because of the intarsia. Duh, I should have realized that! On top of that, I discovered that his feet have grown significantly since the last pair of socks I made him!! Very inconsiderate of him, don't you think? In any event, he wanted to wear them home as well. I bet it was fun trying to get them off his feet that night. 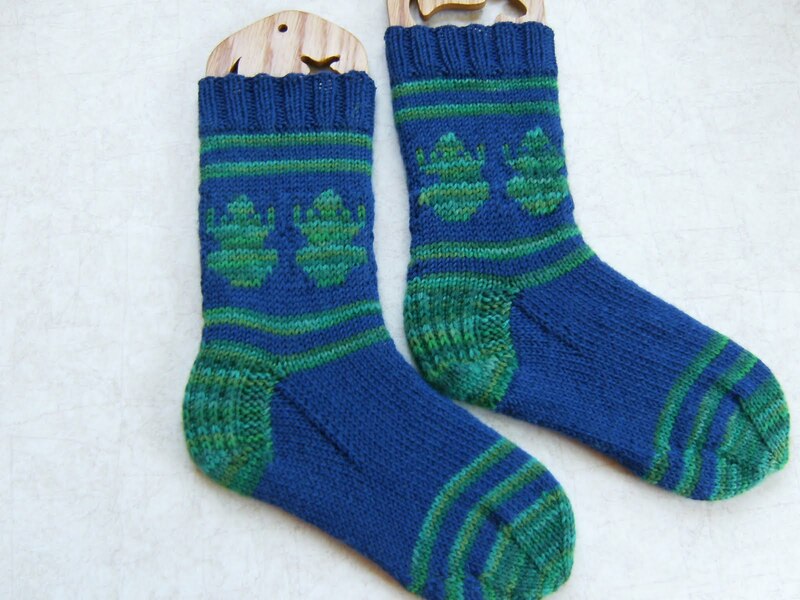 I used Cascade Heritage for the navy and some left over bits of Knit Picks Stroll in "Canopy". I love that yarn! If you think you might like the chart, I'll post it. Just click on the picture to enlarge it. I used size 2.75 mm needles and 52 stitches which gave me a repeat of four frogs. Copyright 2010 by Elaine Fitzpatrick. Permission is granted to make and sell items from this pattern provided that credit is given to me as the designer. Permission is not granted to reproduce the actual pattern, or post it, or distribute it, without my express permission. Please respect my copyright and play nice! Materials: One skein of worsted weight cotton in a solid color such as Peaches & Crème or Sugar ‘n Cream if you are using the bib for meals. If, on the other hand, you want to use it as a “drool” bib, I would recommend using a superwash wool. The cotton has a tendency to absorb the moisture, whereas the superwash wool will wick the moisture and keep baby nice and dry! Sample was done in Peaches & Crème Apple Green. *Row 12: (k1, p1) x2; k1; p9; k1; p3; k1; p4; k1; p3; k1; p2; k1; (p1, k1) x3. Row 13: (k1, p1) x3; (k3, p1) x2; k4; p1; k3; p1; k10; (p1, k1) x2. Row 14: (k1, p1) x2; k1; p9; k1; p3; k1; p4; k1; p3; k1; p4; k1; (p1, k1) x2. Row 15: (k1, p1) x2; k5; p1; k13; p1; k7; (p1, k1) x3. Row 16: (k1, p1) x3; k1; p3; k3; p13; k1; p5; k1; (p1, k1) x2. Row 17: (k1, p1) x2; k6; p1; k18; p1; k3; (p1, k1) x2. Row 18: (k1, p1) x2; k1; p3; k1; p16; k1; p6; k1; (p1, k1) x2. Row 19: (k1, p1) x2; k7; p1; k15; p1; k5; (p1, k1) x2. Row 20: (k1, p1) x2; k1; p5; k1; p13; k1; p7; k1; (p1, k1) x2. Row 21: (k1, p1) x2; k8; p1; k12; p1; k7; (p1, k1) x2. Row 22: (k1, p1) x2; k1; p6; k1; p11; k1; p8; k1; (p1, k1) x2. Row 23: (k1, p1) x2; k9; p1; k1; p6; k3; p1; k8; (p1, k1) x2. Row 24: (k1, p1) x2; k1; p7; k1; p2; k1; p6; k1; p9; k1; (p1, k1) x2. Row 25: (k1, p1) x2; k9; p1; k8; p3; k8; (p1, k1) x2. Row 26: (k1, p1) x2; k1; p6; k1; p12; k1; p7; k1; (p1, k1) x2. Row 27: (k1, p1) x2; k8; p1; k13; p1; k6; (p1, k1) x2. Row 28: (k1, p1) x2; k1; p4; (k1, p7) x2; k1; p6; k1; (p1, k1) x2. Row 29: (k1, p1) x2; k7; p1; k15; p1; k5; (p1, k1) x2. Row 30: (k1, p1) x2; k1; p4; k1; p11; k1; p3; k1; p6; k1; (p1, k1) x2. Row 31: (k1, p1) x2; k7; p1; k15; p1; k5; (p1, k1) x2. Row 32: (k1, p1) x2; k1; p5; k1; p14; k1; p6; k1; (p1, k1) x2. Row 33: (k1, p1) x2; k7; p1; k14; p1; k6; (p1, k1) x2. Row 34: (k1, p1) x2; k1; p5; k1; p13; k1; p7; k1; (p1, k1) x2. Row 35: (k1, p1) x2; k9; p1; k11; p1; k7; (p1, k1) x2. Row 36: (k1, p1) x2; k1; p6; k4; (p8, k1) x2; (p1, k1) x2. Row 37: (k1, p1) x2; k9; p1; k7; p1; k4; p1; k6; (p1, k1) x2. Row 38: (k1, p1) x2; k1; p5; k1; p4; k2; p2; k4; p9; k1; (p1, k1) x2. Row 39: (k1, p1) x2; k9; p1; k4; p2; k1; p1; k4; p1; k6; (p1, k1) x2. Row 40: (k1, p1) x2; k1; p5; k1; p2; k1; p1; k1; p2; k1; p4; k1; p8; k1; (p1, k1) x2. Row 41: (k1, p1) x2; k3; p1; k5; p1; k4; p1; k2; p1; k4; p1; k6; (p1, k1) x2. Row 42: (k1, p1) x2; k1; p6; k4; p3; k1; p2; k1; p1; k1; p8; k1; (p1, k1) x2. Row 43: (k1, p1) x2; (k4; p1) x3; k14; (p1, k1) x2. Row 44: (k1, p1) x2; k1; p14; k4; (p4, k1) x2; (p1, k1) x2. Row 45: (k1, p1) x2; k4; p1; k1; p1; k22; (p1, k1) x2. Row 46: (k1, p1) x2; k1; p20; k1; p3; k1; p2; k1; (p1, k1) x2. Row 47: (k1, p1) x2; k2; p1; k3; p1; k1; p1; k20; (p1, k1) x2. Row 48: (k1, p1) x2; k1; p20; k1; p1; k2; (p1, k1) x4. Row 49: (k1, p1) x2; (k3, p1) x2; k21; (p1, k1) x2. Row 50: (k1, p1) x2; k1; p20; k1; p1; k1; p4; k1; (p1, k1) x2. Row 51: (k1, p1) x2; k4; p1; k2; p1; k21; (p1, k1) x2. Row 52: (k1, p1) x2; k1; p20; k1; p2; k1; p3; k1; (p1, k1) x2. Row 53: (k1, p1) x2; k5; p2; k22; (p1, k1) x2. Row 54: (k1, p1) x2; k1; p27; k1; (p1, k1) x2. Row 55: (k1, p1) x3; k25; (p1, k1) x3. I'm so sorry for whatever you've been going through & I pray that things will get turned around. It's funny how sometimes when we're going through a rough patch we don't feel like knitting, but then we're drawn back to it for comfort. There are times that I think that I would've lost my mind if it weren't for knitting. One particularly difficult time, I must have have 10 or 12 projects going all at the same time. My oldest daughter was trying to straighten up the house & she discovered all the knitting that was about & she said, "Mom, are you going through some sort of mid-life crisis or what?" At the time, I probably was....over her. Your frogs are terrific! Seriously...I need to make a baby or a child's blanket from all your designs. It would be super cute! Sorry you/yours are going thru a rough time. Hope things brighten up soon. Love the froggies! Such cute designs....all of your stuff! SO sorry you and your family are going through a hard time. Remember GOD Loves you and He will help you through it and give you strength.